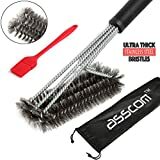 Asscom brand,Two BRUSHES provided,We will put a big stainless steel BBQ Grill Brush and a small 100% small silicone brush. Three heads means triple the surface area compared to standard wire brushes.Triple the surface area of standard wire brushes, with this bbq accessory you will be able to scrub clean all parts of your barbecue grate faster than ever before. SAFE OF ALL GRILL TYPES. Whether you have porcelain, stainless steel, cast iron, infrared, ceramic, electric, gas, charcoal, Char Broil, Big Green Egg or Weber Genesis, you can scrub away safe in the knowledge that you will not mark your grates. OPTIMAL HANDLE LENGTH. Through extensive testing we have found 18 inches to be the best length for a grill brush. Long enough that your hand wont get burnt, but short enough that you retain excellent leverage and control while cleaning your grate. 6x REINFORCED WIRE HANDLE WONT BEND. 6 shafts of wire enclosed in tough plastic ensure your brush will stay rigid and clean efficiently no matter how much elbow grease you use. This heavy duty tool has been built to last! All brushes wear out eventually, but we guarantee you will get a minimum of one year of solid use from your new grilling brush. If, within the first year, you are not completely satisfied with your purchase for any reason, please do not hesitate to contact us. Two BRUSHES IN ONE,We will put a big stainless steel BBQ Grill Brush and a small 100% small silicone brush, which is very health and clean. Three heads means triple the surface area compared to standard wire brushes. Make light work of even the toughest burnt on sauce and grime in a fraction of the time. No longer do you have to settle for anything less than a beautifully clean grate on which to cook your food. As soon as you hold the brush in your hands you’ll notice the seriously heavy duty construction. Stiff, thick bristles that wont flatten or gum up combined with a 6x plastic reinforced wire handle that will not bend. Once you have added this premium quality barbeque tool to you collection you can be sure you won’t need a replacement for a very, very long time. Worried about scratching your expensive porcelain coated grate? Considering a brass bristled brush? While some stainless steel brushes can leave marks, this will not happen with any Asscom Grillers brush. You can scrub away safe in the knowledge not a single mark will be left on your grill. How to we know? Aside from our own extensive testing, out of tens thousand customers not one has reported any of our brushes leaving a mark. GRILL BRUSH SAFETY. All brushes wear out eventually. As they get older it is important to check no bristles are coming loose. If this starts happening it’s time for a replacement. After every use with a wire brush wipe down the grate with a wet cloth to check if any bristles have come off and got stuck to the bars. GUARANTEE. No Risk. If you are not satisfied with this BBQ Brush, please do not hesitate to contact us.